The new provincial Liberal administration has made the creation of a merit-based system of cabinet appointments the centre-piece of its first session of the House of Assembly. The bill to give effect to their policy is not perfect but by the time it clears the House later this spring, the province will have a long way from the pernicious practice of the former administration - from 2003 onwards is one administration - of appointing people chiefly on their ability to follow directions from the Premier's Office. Merit is the Liberal watchword and we should all be cheering a system that will base choices as they should be, that is on qualification, and dismiss irrelevant considerations. If the Conservatives or New Democrats can improve the Liberal bill, then the Liberals should accept the amendments and move us all forward. We would all be better off for it. How strange it is then, that a senior minister in the administration for merit should push the federal government to make an appointment to the Supreme Court of Canada on the basis of anything but merit. To understand precisely how insane an idea we have at Muskrat Falls, think of it this way. In Quebec, provincial government policy is to maintain a pool of electricity that is very cheap to produce. This is for use inside Quebec so that the people of Quebec always have really cheap electricity. In Newfoundland and Labrador, provincial government policy is to force local consumers to pay double their current low rates in order to pay for Muskrat Falls. Nova Scotians get a block of power for free and access to an additional quantity of power at Nova Scotia market rates, which are far less than Muskrat Falls will cost local consumers. If they can sell any other electricity, they will but again, the cost will be subsidized by the people of Newfoundland and Labrador who are paying the whole cost plus profit. This isn't new. It has been the case since before Danny Williams announced his retirement scheme called Muskrat Falls. Your humble e-scribbler pointed out the subsidy insanity before the announcement. Williams and Nalcor boss Ed Martin confirmed it when they unveiled the Muskrat Falls project. Apparently, Donald Trump is the most unpopular American presidential candidate since 1992. The Toronto Star's American correspondent produced a lovely article on Friday. It started with the results of a couple of recent comparisons showing how unpopular Donald Trump is in survey research conducted during the current primaries compared to every candidate going back to 1992. Then Daniel Dale tells us what will happen when this trainwreck gets to the general election November. If you've already decided Trump is the antiChrist - that is, if you are a regular Star reader - you will skim this confirmation of what you already knew. But you might want to look more closely at this piece to see a couple of really glaring - and really obvious mistakes - it makes. The folks at the City of St. John’s wanted to boost their curb-side recycling program. Last fall, they launched a campaign called “Blue is the new Black”. 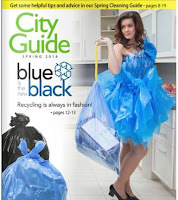 Blue is the colour used for recycling bags and the campaign name is fairly plain play on a very old phrase to describe something that is currently fashionable. No one seems to have noticed the campaign until last week when the St. John’s Status of Women Council took issue with the cover illustration from the newly issued guide to city services (right). The moment when Jian Ghomeshi’s lawyer established during the trial that witnesses against him had colluded in their testimony and had lied – even if by omission – there was very little chance that the judge could possibly have found the former broadcaster guilty of anything. The standard of proof in a criminal trial is proof “beyond a reasonable doubt.” This does not mean, as judges in Canada frequently put it, that there is some scientific or absolute proof of guilt.In reaching his decision. More than 1,000 people showed up for them. More than 28,000 people used the government website that the folks at the Office of Steve Kent call an app to make it sound more impressive to the punters. Another 700 ideas arrived by email, fax, or carrier pigeons. Five separate actions were commenced alleging that former residents of five IRS [Indian Residential Schools] in Newfoundland and Labrador, operated by the Canadian Government, were neglected, sexually and physically abused. It is alleged that the sole defendant in these actions, the Canadian Government, had the full responsibility for these residents after Newfoundland and Labrador joined the Confederation on March 31, 1949. Since the Newfoundland and Labrador residential schools in the class action suit were not run by the Government of Canada and were not either in kind or substance anything like the Indian Residential Schools covered by the earlier apology and payment, why is this class action suit going anywhere in the courts or outside against the Government of Canada? Access to documents from government are one thing. Understanding what they say is quite another. CBC requested batches of documents from the provincial government about efforts by the people of Little Bay Islands to relocate from their isolated community to other places. “No government money in budget for rural relocation program” ran the headline on the story last week. The sub-head claimed there was “no way to pay up-front costs” of relocation. Unfortunately for the folks at CBC, the documents didn’t say that. Consultants have consistently reported that the Muskrat Falls project is well-managed and well-led. Despite that independent analysis, MFP has been dogged by significant cost over-runs, significant problems with performance on meeting project timelines, and chronic problems with communications/public disclosure. Review of Muskrat Falls project by a company called Independent Project Analysis. Majority of slides (20) contain background information on project and contractor or bland statements of fact. No details on research specific to this assessment beyond reference to interviews. At the entrance to the new west-end high school, there's a sign that warns drivers that only those big yellow student transportation vehicles can go around back to the drop off point there. Cars should go to the front of the school. There's a simple word in English for those big yellow conveyances. We call one of them a bus. According to the sign, it's "busses". There is a word in English spelled "buss". It's a synonym for kiss in American English. The sign looks funny if you know that. To answer the question on spelling, go check the dictionary. Even the Oxford shows that the plural of the vehicle may have one "s" or two. But look up in the URL and you will see that Oxford is directing you to a site for American English if you are from an IP address in North America. The online version of the Cambridge English dictionary notes a difference with the two "s" version being American. Ditto the UK English version of the Oxford, once you hunt around a bit to find it. So for about a century, English speakers have settled on buses as the plural for the vehicle. Hunt around a bit and you will find the "buss" version of the plural used to refer to clearing the table in a restaurant or to the computer parts. That actually makes sense if people are aware of the multiple meanings for the same word and want to distinguish between the human transporter and the data one. So while the way the English school district has used busses to mean the plural of the student transporter, that isn't wrong - strictly speaking - if we are using American English spelling as the default. It is just very antiquated. And unless, they spell connection with an "x" - connexion - then they really should lop one of the "s" things off their plural form of "bus". Odds are in this case, that the folks making up the signs got the spelling wrong and didn't check to see what was the most common spelling. Wonder if anyone at the school has picked up on this yet? The deficit for 2015 will be a record. We know that because of comments at the House of Assembly by Premier Dwight Ball and finance minister Cathy Bennett. 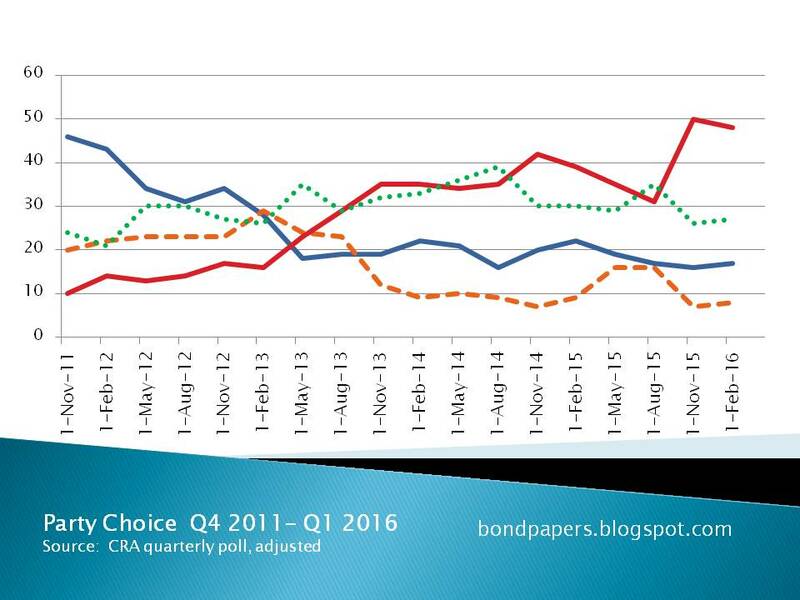 News media are reporting that as "raising the province's borrowing capacity" but that's not quite what is going on. The markets will determine the province's borrowing capacity. That is, the folks lending the money will tell us how much we can borrow. What went on in the House on Thursday was a wee bit different. For the third day in a row, the opposition has asked one question over and over again, with a couple of minor variations. They’ve asked education minister Dale Kirby why the New Liberal government that took over last December hasn’t called elections for the school board the Conservatives appointed in 2013 after they crammed all the English language school boards together in one pile. Even if you have never heard of this issue before the instant you read that sentence, you know precisely where this is going. After all this time, it remains an enduring mystery how a guy who held himself out to be the great seer of oil prices still gets quoted on oil prices despite the number times he has fundamentally gotten it wrong. Some local reporters still use Wade Locke as the go to guy on oil. "It's always been the case that at some point, demand would start to swamp supply." "At some point in time demand will significantly exceed supply and prices will have to rise well beyond $50 as well. But again that's only a matter of time, and a matter of exactly when." Just as there is a 50/50 chance of anything occurring - it either will or it won't - so too is it likely that, over time, the demand for any commodity will swamp supply. The result - inevitably - would be that prices would rise. This is Economics 1001 kinda-stuff. Or it could be a decade from now. The thing for folks in government, having some idea about where prices are going can mean the difference between a massive surplus or, as in the more recent times, massive deficits. Having insisted shale was nonsense and that oil was about to skyrocket any day now, Wade is a wee bit more shy these days since those other predictions didn't pan out. "I was one of the guys suggesting to government a couple of years ago use $105 (a barrel in preparing a budget), " Locke told Roberts. "I don't have any pretension that anything I say with respect to oil prices has much in the way of precision." Wade never actually had much precision, but at least now the old boy has given up the pretense. One of the provincial Conservatives’ signature new initiatives in the first session of the legislature after the 2003 election was a bill that supposedly set fixed election dates. Changes to the House of Assembly Act also triggered a general election if the Premier left office other than within a year of an existing fixed election date and reduced the number of days the Premier had to call a by-election from 90 days to 60 days. When the bill appeared in the House, there were some obvious problems with it. For starters, and in keeping with the constitutional traditions of Canada, there actually were no fixed dates for general elections. The first clause of the amendment bill made it plain that nothing in the bill change the power of the Lieutenant Governor-in-Council to call an election whenever it wanted. Despite delivering bad news about the provincial government's finances since taking office, the provincial Liberals continue to hold strong public support, according to the most recent poll by Corporate Research Associates. Support for all three parties remains essentially at the same level it was in the fourth quarter of 2015. In the chart below, the Liberals are at 48% of respondents (red line), the Conservatives are at 17% (blue), and the NDP are at eight percent (orange). Undecided, no answer, would not vote combined is at 27%, shown by the dotted light blue line. 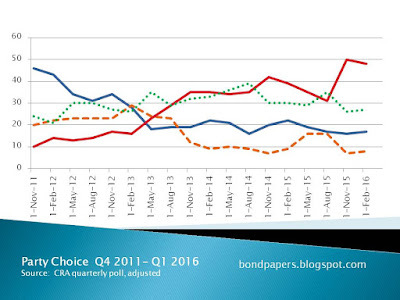 CRA reports its party support as a shared of decided respondents. SRBP adjusts the figures to show party choice as a share of all respondents. The provincial government can only spend money approved by the House of Assembly. In parliamentary language, the House grants supply to the government, as in a supply of money. Each year, the government asks for interim supply first. That's a portion of next year's planned spending to tide them over from the start of the new financial year until they can get the whole budget passed. There is no hard and fast rule as to how much the interim supply request is compared to the whole budget. But, if you look at the past eight years or so, you can find one. That was Premier Dwight Ball talking to reporters on Tuesday after the Throne Speech that set the agenda for his new administration. He was talking about the prospect that he might get some cash from Ottawa to cover the province’s massive deficit. What Ball said isn’t true. It’s hard to know why the false version of events lives on, but it does. All sorts of intelligent people continue to believe – and repeat – the story that Equalization reforms made in 2007 were designed to screw Newfoundland and Labrador. But it is most emphatically not true. In 2003, Paul Davis' predecessor as leader of the provincial Conservative party went to Ottawa to beg for a hand-out. Then he begged for more through Equalization. Got what he asked for. Pretended he didn't, backed by some economist from the university named Locke. Threw a childish tantrum and kept at it for years. Drove the province up on the rocks through unsound financial management that carried on through all his successors. And now Danny Williams' successor is carrying on the fine tradition. The first Conservative private members' resolution in their new role as Official Opposition begs Ottawa to send money to fix the mess he and his pals created. and BE IT FURTHER RESOLVED that this hon. House urges the Government of Canada to modernize the federal-provincial arrangements, including the Equalization Program and the Fiscal Stabilization Program to more fairly and promptly reflect our province's needs, and to more fairly account for natural resource revenue. James McLeod has released the data he compiled to produce his Saturday story on the number of people in the provincial public service who make a salary of more than $100, 000 a year. What James has done is follow the Open Data policy the former Conservative government announced but never implemented. The new crowd running the place are understandably a bit preoccupied at the moment but Open Data is an idea they should latch onto. Not only does it save money, but it also puts a pile of government data in the public where folks can make good use of it. If you want to support innovation, making information readily available is one of the best things any government can do. McLeod submitted a series of access to information requests to the core government departments as well as the larger agencies and Crown corporations. Some responses, like the one for Memorial University, is pending. McLeod put all of the bits and pieces into a spreadsheet and that’s what he has offered up to the public to do with as they wish. SAN RAMON, Calif.--(Chevron via BUSINESS WIRE)--Mar. 7, 2016-- Chevron Corporation (NYSE: CVX) today announced it has started producing liquefied natural gas (LNG) and condensate at the Gorgon Project on Barrow Island off the northwest coast of Western Australia. The first LNG cargo is expected to be shipped next week. "We expect legacy assets such as Gorgon will drive long-term growth and create shareholder value for decades to come," said Chairman and CEO John Watson. "The long-term fundamentals for LNG are attractive, particularly in the Asia-Pacific region, and this is a significant milestone for all involved." Chevron is positioned to become a major LNG supplier by 2020. In particular, Chevron's Australian projects are well located to meet growing demand for energy in the Asia-Pacific region and more than 80 percent of Chevron's Australian subsidiaries' equity LNG from the Gorgon and Wheatstone projects is covered by sales and purchase agreements and heads of agreements with customers in the region. "We congratulate the Gorgon workforce on this achievement," Watson continued. "This is the result of the collaboration of hundreds of suppliers and contractors and many tens of thousands of people across the world during the project design and construction phases." The gaggle of American political scientists at the Monkey Cage have been doing a series of posts about Donald Trump's campaign for the republican nomination. They started with a post that reminded us that most voters aren't ideologues. That is, folks don't conform to a text-book set of definitions of left, centre, or right and within the major parties in the United States, there is lots of variation within the very broad Republican and Democratic tents. In that vein, the most recent post on the subject reports on polling that suggests Trump's views are closer to what Republican voters believe as opposed to what the party Establishment espouses. Most people seemed to have figured out early on that it's the economy. And, of course, lots of disaffected or economically displaced white folks are loving up Trump's airing of White identity and grievances. Most of you have likely never heard of Jim Thistle. Jim passed away on Thursday after a brief illness. He was only 61 and until he was diagnosed with a very serious and ultimately fatal illness, Jim had more mental and physical energy than most of us had when we were kids. Jim was blessed with one of the sharpest minds this country has ever produced. He was kind, gentle, funny, and generous with his time and his insights. Despite being one of the busiest people around, let alone one of the busiest lawyers around, Jim had time for lots of other pursuits including working on a master's degree in history. In China in these days of hard economic times, none are hit so hard as the people who work in zombie industries. These are industries that keep producing despite there being no market for the product. Like coal. Or cement. Or iron. In most cases, the government steps in with fresh credit or other supports to keep the plants going and keep workers employed rather than close them down. One of ‘em asks if the other had counted Danny Williams’ penchant for them. Yes, butts in yer humble e-scribbler who was not part of the original discussion: Cameron inquiry. 270 in a four hour stint, plus eight “quite frankly”s. If anyone on the Internet had that kind of obscure information, it would be The Scribbler or labradore. So then, you know your humble e-scribbler had to check the record by searching on SRBP for all appearances of the phrase “verbal tic” and the plural. For some interesting insights into the way government works, take a look at an access to information request someone submitted for documents related to the bond ratings for the province issued earlier this year. First, notice that the department responsible for openness and transparency continues to follow the decidedly closed and opaque practice of printing electronic documents, scanning them, and then posting a picture of the document. This makes it harder to find information in the documents and use it and of course that is precisely the intent of the practice. Second, notice the enormous amount of effort spent by finance department officials to obtain comparative credit ratings for other provinces and for Newfoundland and Labrador over time. It’s a relatively meaningless piece of information but it sucked up an astonishingly large amount of email traffic. A tax to pay a tax. Well, that’s what Jim Feehan suggested last week. He told a luncheon meeting of the St. John’s Rotary Club that the government should consider financing the rest of Muskrat Falls through a special tax. Start paying today, Feehan said, and avoid borrowing money and paying that money plus the interest in the future. Don’t dismiss the notion quite so quickly. There is some sense in the idea. But before you give a big thumbs up to Feehan’s idea, though, consider all the details.